Act of Impalement are a Blackened Doom Metal trio from Tennessee, after making some waves last year with their release "Hyperbroean Altar" which I reviewed a while back for our friends over at Summoning Spirits, they've put out an all new EP this year entitled "Echoes of Wrath". It's three tracks of bludgeoning Doom Metal with a thick Black Metal accent. The track "Echoes of War" opens up their latest EP and you couldn't ask for a better example of their sound, mixing the Black Metal styled vocals with bone crushing mid-tempo riffs, it breeds a feeling of complete disgust and hatred, and it's absolutely stunning. With a short stint of feedback, the blackened guitar riff blazes in, laying down a furious riff, while the drums thunder away like an artillery barrage. Just past the halfway mark the song starts slowing down a bit, taking on more and more of that good ole' Doom Metal feel we love. The guitar calms down just a bit, and starts to wail like a clipped banshee, and the whole group hits a dark and heavy groove. The fine people over at Caligari Records have the good taste to take these two releases and put them together on one tape, now listening to them back to back, it works, very well. 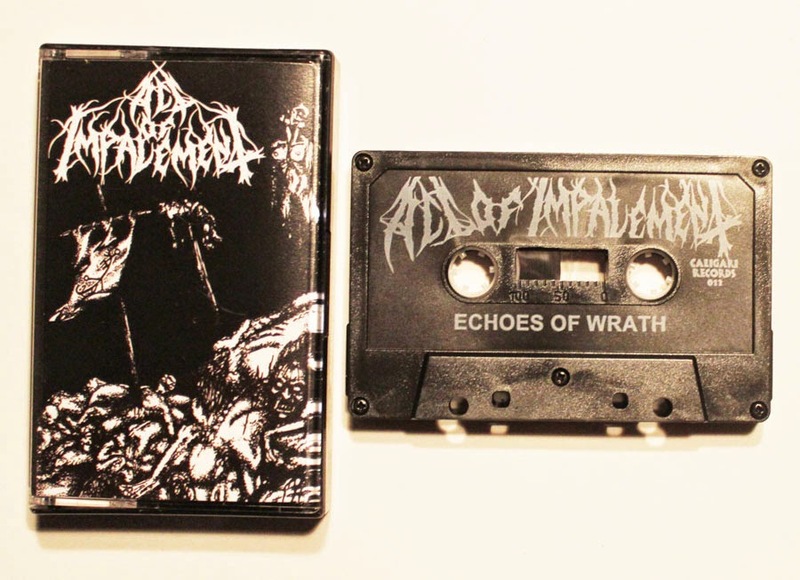 They've decided to put out just 100 of the "Echoes of Wrath/Hyperborean Altar" tapes, so head over to the Caligari Records Store if you love that nostalgic feel you get from cassettes. If you're just look for the digital copy, you can find those on Act of Impalement's very own Bandcamp.